Metaphors are powerful. They help us understand abstract problems in terms that are physical and familiar. Through this association, metaphors often suggest a solution. They are merely words but they can be more powerful than facts and figures. Those who legislate know the power of metaphor. Intellectual property is such a common metaphor that most just refer to it by its acronym (IP). But the familiarity of this metaphor also restricts the way we think about information. If information is property, then the chief issue is ownership, and ownership entails certain exclusive rights. 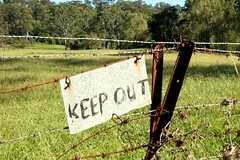 If I own a piece of land, I can build a fence around it and keep others out. I can sell the land, rent it, build a house on it. These are the rights that the state gives me, and this is backed up by hundreds of years of property law. Information, however, has properties that make it sufficiently different from physical objects to question whether the property model is a good metaphor for information. Unlike natural resources, information is non-depletable. Overuse of information does not lead to its scarcity, nor does it attenuate its value; in fact, it does just the opposite. Secondly, it is non-rival, meaning that my reading an article does not deprive you of reading the same article. Lastly, it is difficult to exclude individuals from gaining access to information. Information, especially in its digital form, is porous and moves very easily between people. This is why I find the Open Access metaphor so problematic. By thinking of information through the traditional property metaphor, we restrict ourselves to a rhetorical framework that views information as a limited, depletable, and excludable resource. This framework leads to solutions that enhance the privatization of information. Information becomes the exclusive property of individuals and corporations and ownership rights are given protection by the courts. In his latest book, “The Public Domain: Enclosing the Commons of the Mind” (available in your favorite bookstore or as a free download), James Boyle, professor of Law at Duke University, calls the privatization of public land the “first enclosure” and argues that we are currently going through a second enclosure — “an intellectual enclosure of the mind.” This is also a powerful metaphor since science is an iterative process, building upon prior discoveries and correcting past mistakes. Minds need to be open. The book is a lively read that sums up many of Boyle’s older and more academic writings on information as property. So if property is such a bad metaphor for information, what metaphor should replace it? Boyle believes that what is needed is a new way of thinking about information; a new ethos similar to environmentalism, which aligned disparate groups like farmers, duck hunters, and birdwatchers into a coalition for protecting natural resources. Without an overarching ethos, Boyle worries that a narrow view of information based on the property metaphor will prevail. As a result, science (and the benefits it creates for society) will suffer. 8 Thoughts on "Information as Property"
In considering ownership of, and rights to, information in this context, perhaps one should distinguish ‘data’ and ‘interpretation’. One might argue that ‘data’ in scholarly articles should be freely accessible – for mining, mash-ups, etc. – but the text, which is essentially interpretation, need not be. This may be a particularly important idea for publishers, since the interpretation is not what is funded by grant-giving bodies and includes much of the publisher’s ‘added value’. Expressions may be subject to copyright but not facts. In the book commissioned by the National Research Council, “Bits of power: Issues in global access to scientific data”  the authors argue that data are the “building blocks of scientific knowledge and the seeds of discovery.” They talk about free access to the underlying data, not the article. The authors call for a “distributed international network of data centers” (p.10) that would allow for fair use of scientific data. Licensing would distinguish how the data could be used (free for non-profit academic purposes; negotiated under commercial uses). A very extensive article  (of book length) written by two of the members of the NRC committee develops this idea. National Research Council. Bits of power : Issues in global access to scientific data. Washington, D. C., National Academy Press, 1997, pp.235. Reichman, J. H., & Uhlir, P. F. 2003. A CONTRACTUALLY RECONSTRUCTED RESEARCH COMMONS FOR SCIENTIFIC DATA IN A HIGHLY PROTECTIONIST INTELLECTUAL PROPERTY ENVIRONMENT. Law and Contemporary Problems 66: 315-462. Metaphors are indeed powerful, but they are also limited in scope. In the case of information, while it indeed has the attributes Phil mentions, those are not the only attributes they have, nor are they necessarily the attributes addressed in the metaphor of information as property. There are a number of things the metaphor does address — for instance, the fact that information has value. In that way, it is like property. Also, people want to own information (trade secrets) or share information in a way that is commercially sustainable (patents and copyright). People also want to protect information from misuse or pollution, again like property or land. Information can be personal (medical records, financial information) — again, very much like property. Information can be stolen, vandalized, or mined. For a framework of laws around something as powerful as information, we do need a metaphor to govern the infractions and monitor fairness (how “Creative Commons” draws on the “commons” aspect of the property metaphor). Even “open access” is about a door, which implies property (a structure, a house, a vault — pick your closed aperture). To me, the property metaphor for information is useful in a lot of ways, including how we talk about mining, stealing, sharing, opening, protecting, maintaining, and a host of other small metaphorical flourishes that really help anchor the concept to reality. But it is only useful as far as it goes. Once the metaphor fails, we should know to acknowledge it. As for sharing data as opposed to information, there was a recent very good article about why this isn’t advisable or even likely. Like property, information also needs a “buyer beware” sign on it most of the time . . .